"When you fish with professional athletes and coaches for a living, you learn to deal with a maze of scheduling nightmares. Fishing dates must be set well in advance of weather reports, and often at the last minute you are left to Mother Nature to know what kind of trip you will take - inshore or offshore? And what boat will be needed? 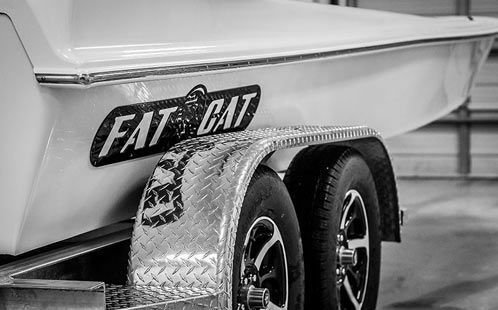 Fat Cat Boats out of Corpus Christi, Texas has solved the problem, with one boat to meet every angler's need. Recently we fished East Matagorda Bay in some skinny water, and I witnessed some amazing hole shots in twelve to fourteen inches of water, which is an amazing feat when you take into consideration we were fishing out of a HV 26' Fat Cat with a 400 Mercury - now that's some weight. Passengers on the 26' were comfortable and at ease as the boat cut across the bay. The high performance design and handling technology on the Fat Cat made our trip smooth and easy. One week later I was joined by New York Jets quarterback Bryce Petty and his dad, as we set off for an offshore trip 35 + miles out of Port O'Conner. Once again, the HV 26' Fat Cat was our ride to some of our favorite numbers. The thing that amazed me the most about this boat was its versatility. It can cut through the bays and scream offshore. In what should have been a two hour trip, we made the run in a little over 45 minutes. It was a high and dry ride setting us on fish much earlier than the competition. In my experience of hosting Reel Time, I have been privileged to fish from Mexico to Florida on many exceptional boats. However the HV 26' Fat Cat is clearly the boat to handle the needs of your trip, whether inshore, offshore or whatever Mother Nature deals up.